Is there ever a garden that suffers a shortage of zucchini in August? As the zukes roll in, and we’ve tried steamed squash, panfried squash, squash with herbed butter, stuffed squash, zucchini bread, and maybe even shrimp with zucchini, Swiss steak and ratatoille. Yet, we still crave something new, different, and above all, easy. This recipe by Mollie Katzen, author of the classic vegetarian Moosewood Restaurant cookbooks, suits the bill—sautéed on one side, then finished in the broiler. 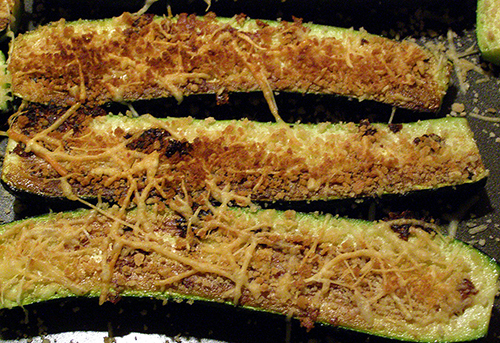 With just garlic, a little olive oil, Parmesan cheese, and optional breadcrumbs, zucchini become delightfully crunchy on the top and succulent in the middle, reminiscent of deep-fried zucchini, but fresher and far more healthy. Although the original recipe states that garlic can be minced or crushed in a press, mincing is preferable if there’s time. According to America’s Test Kitchen, mincing produces larger chunks with more intact cell walls, which are less likely to brown and become bitter when sautéed. However, pressing the garlic is much faster, and if the zucchini are young and fresh, their sweetness will be somewhat of a foil for any garlic bitterness. 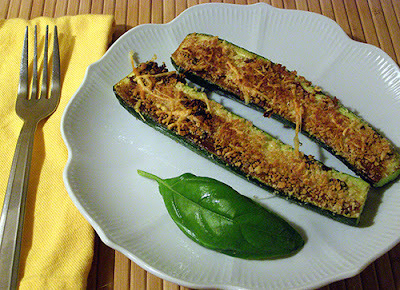 When topping the semi-sautéed zucchini, you can either use breadcrumbs followed by Parmesan, or mix the breadcrumbs with the Parmesan and use the pre-mixed topping. Since the amount of breadcrumbs and Parmesan is variable, you needn’t even measure if you’re in a hurry, just apply a thin layer of each to your zukes and run them under the broiler to finish. I hope you’ll enjoy this late summer treat as much as my family does. Halve zucchini lengthwise. Place a medium (large for large quantity) skillet over medium heat (or use medium or large electric skillet). After 1 minute add oil and swirl to coat. Turn down heat to medium low and add garlic. Sauté 1 – 2 minutes, being careful not to brown. 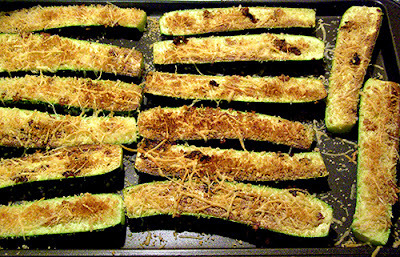 Place zucchini cut-side down on garlic. Sprinkle lightly with salt and pepper. Turn heat up to medium high and sauté about 5 – 7 minutes, until slightly tender when poked gently with fork. Transfer zucchini to baking sheet, cut side up. Top with garlic from skillet if desired. 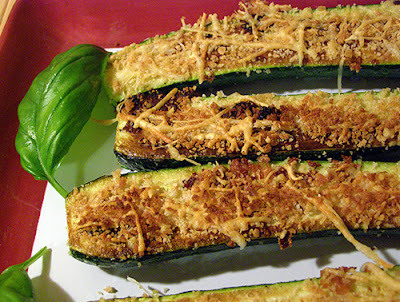 Sprinkle with bread crumbs, then Parmesan—or mix together bread crumbs with Parmesan and sprinkle onto zucchini. Place under broiler about 6 inches from heat. Broil until slightly brown, about 4 minutes. Best eaten the first day, but leftovers can be re-broiled in a toaster oven. For best results, don’t reheat by microwave—the topping will be soggy.